Jenny Matlock: Who's having another Giveaway? Owl be honest with you. It's me! About five weeks ago I was shopping at Joanne Fabrics and came across an adorable owl dish towel. There was only one. I bought it. On the way home I debated with myself. Keep the owl towel, or give it to our daughter who really, really likes owl stuff. I gave it to my daughter. Cuz, yeah, that's the kind of mom I am. After we ate, she brought out two small gifts. One for my husband and I and one for her grandparents. I'm not sure why my head said, 'owl dish towel', but it did. I have faulty wiring like that. We opened up the little gifts and there was no owl dish towel inside. I cried. I laughed. I cried some more. Cuz, yeah. I am an emotional wreck about things like that. She is due in March and her little bump is growing bigger each week. We are all totally excited. I'm not even a LITTLE disappointed that she didn't give me an owl towel. 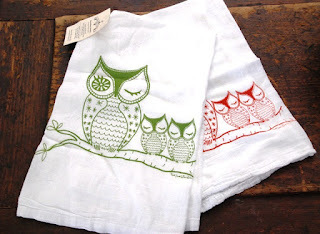 In the spirit of sharing wonderful news, though, I would like to do a giveaway for two brand new owl cotton dishtowels! Thanks for sharing our happy news with us. And since I know you can't all win, I will leave you with this consolation prize knock-knock joke. "WHAT ARE YOU, AN OWL?" What a cute way to make the announcement. That is exciting news, however you hear it. Congratulations! Um HELLO - these towels have my name all over them cant you see it? I can. Look closer...AHHHH - now you see it. Good. We are on the same page. Can I get a HOOT HOOT? So what I love about babies right now? is that my brother and his wife are do in 6 short weeks. YES baby in 6 weeks - Ha ha my wait is almost over! Ok so they are DUE not do...I can't spell. Never claimed to. Mazel Tov! Such great news! Babies are.the.best.ever -- no question. Congratulations to all. Congrats! I love the way babies smell. I could probably list a MILLION things I love about BABIES:) I agreee with Secret Mom Thoughts about the way they smell! I LOVE how they love us no matter what! Even my litle grandchildren that I don't see very often, still love me:) They all make me smile:) And on and on and on... Congratulations on getting a new one to love! You know why I love babies? Cause they are babies! Babies are one of the coolest things, ever! Congratulations!!!! I bet you were dancing for joy with that cute little onsie in your hands when you read it!!!! I know when I become a grandmom one day I will drive my daughter crazy by talking to her belly and not to her... "excuse me, but me and my grandchild are having a conversation here, do you mind??" but the best thing about being a grandparent is that after we give them candies, ponies and FUN!!!!! we get to give them back for clean up, overtiredness and spoilage... Bwwuwhahahahahaha!!!! why yes, our newbridedaughter said she is not thinking of having any babies any time soon, why do you ask??? I see there is another Terra blogger who left a comment here. I love the way your daughter announced the pregnancy to you. What do I love about babies? The way they smell, like peaches. And their teeny tiny fingers and toes. The owl towels are charming. Oh Jenny I am so happy and excited and smiling from ear to ear! After (finally) having a Grand I now know the wonders of it all. The best thing so far is when they just look at you like you are the best thing ever in their lives. NOW I even get called GrandMum...his words! I'm so excited. Oh and those owl towels are adorable and I would love to win them! Oh I'm just so excited for you and what a cute way to tell you! love it! CONGRATULATIONS!!! What's not to love about babies, especially grandbabies! What do I love about babies? Everything. The way they smell, the way their little mouths move when they fall asleep after having a bottle. The way they gurgle when they laugh. And the way they feel in your arms. And a million other things. I love them to pieces and you, too. There can be no one favourite thing about babies, because they are like magic! The change the world with their first little breath ... i love babies!!! Congratulations, Jenny! A new grandlittle to love. Sweet announcement. What I love about babies? Their unconditional acceptance of me as their Nana. I have a 21 month old who came up behind me while I was weeding the garden, put her arms on my back and said, "Big Hug Nana!" Melt my heart. And one 3.5 month-old who smiles widely and toothlessly when I talk to her. They smell so sweet. Their skin is so soft. They represent hope and the future. I'll stop now. But I could go on and on and on. 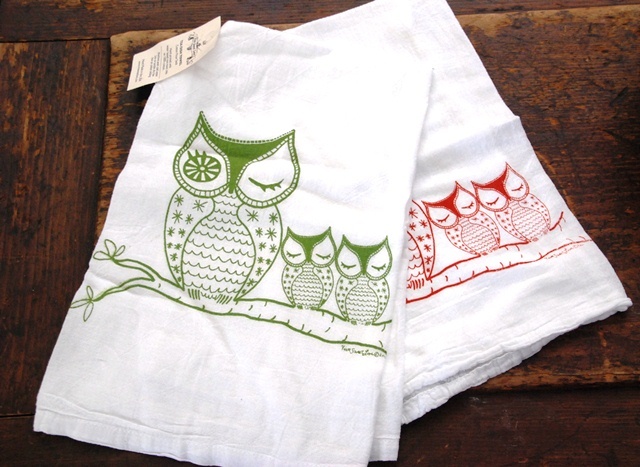 How SWEET and I can totally see why you would think owl towel - they are adorable! Seeing as how its 4am and I'm up for the third middle of the night feeding with our little one, the thing I love about babies is how sweet they are. I love her middle of the night gummy smiles and tiny hands that automatically grab mine. I love your daughter's creativity in announcing the great news! Congrats to all of the family! I think I would incorporate just about every comment above to say what I think is the best thing about babies! They love you no matter what; they smell so, so sweet; and they have a piece of you in them! 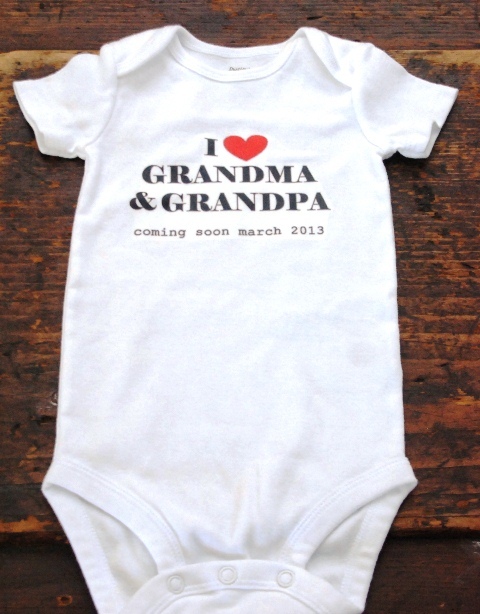 Oh, and I can't wait to have grandlittles of my own... when the time is right! I'm so happy for you and Mr. Jenny! Congrats to you, Ms. Granny Jenny!! Very cute. Congratulations / you must be so excited...wonderful news! What a great way to make the announcement! My daughter is expecting her second on Nov 30th, and there is nothing like holding that brand-new baby that can still roll up into a ball. Love that part! Your daughter is a girl after my own heart! Such a wonderful way to tell you. I got all emotional. But that's like me, our family too. Babies, babies, babies; you have to love and care for them. They smell so good, how can you put them down you want to hold the warm little body and beating heart against you. It is the one opportunity in life when you are in total control. That precious little part of you and your partner's allows you to shape and mould them into lovable human beings. You must put her down, to dream and rest and grow. Babies are little miracles of life. Congrats! I love the smell of babies. In the pilot of Everybody Loves Raymond, Raymond's dad would sniff the youth out of the babies. I would have to agree with him. I used to love breathing in my son's smell after a bath when he was a baby. Oh, I just love good news! Congratulations and so exciting!! What a darling way to announce the big event. As for babies...I love their feet! As said earlier, fab news about your new baby. I'm getting one, no, not having one the end of this month! We had a baby shower last weekend and she was so spoilt, fat tummy and all. I love babies cause they smell so good, well, most of the time! Sometimes they surprise themselves when they cry out loud. I wouldn't want to be back in those booties, starting from scratch in this big wide world. I kiss the little ears too. What an adorable way to make the happy announcement. Congratulations! 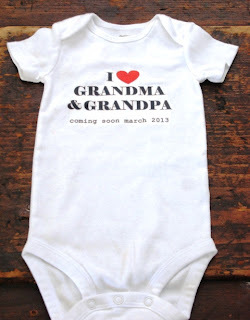 When my daughter told me her news, I was given a gift bagged bib, all embroidered with, "I love grandma." Funny, I never took it out of the wrapper. I'm keeping it forever. Your family is growing and that is just wonderful news; more to love! Congratulations! Amazing news! And what an original way of announcing it! The Owl towels are so cute, I'd love to win them :) Congrats again!